Swivel lounge chair. Rigid foam shell and upholstered seat & back. Polished aluminum base and steel column. 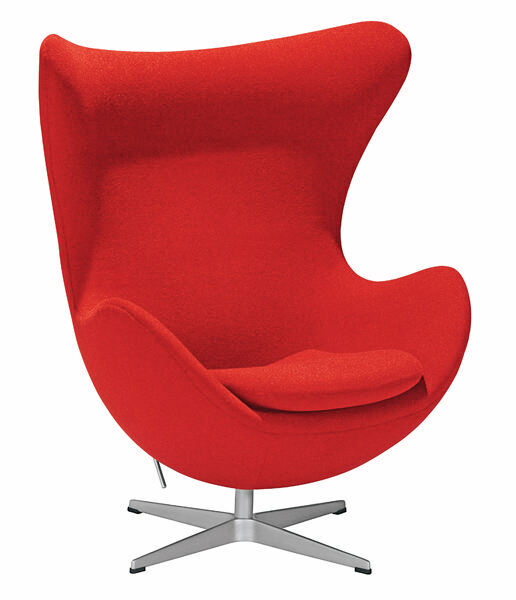 (1902 - 1971) Arne Jacobsen was born on February 11th, 1902 in Copenhagen . Initially he trained as a mason before studying architecture at the Royal Danish Academy of Arts, Copenhagen, graduating in 1927. His architecture includes a considerable number of epoch-making buildings in Denmark, Germany and Great Britain . Arne Jacobsen's designs came into existence as brief sketches and were then modeled in plaster or cardboard in full size. He kept on working until his revolutionary ideas for new furniture had been realized at the utmost perfection. Arne Jacobsen is the Danish architect who mastered the most personal and successful interpretation of the international functionalism. In 1930, he established his own design office, which he headed until his death in 1971, and worked independently as an architect, interior, furniture, textile and ceramics designer.